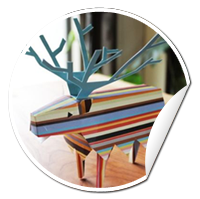 Last week we announced our new game Tearaway and alongside it we gave out the plans to make your very own papercraft Elk friend, as seen in the trailer. We love them so much we’ve printed them out to put on the wall here at Mm Towers, but there’s still plenty of room to fill up, so how about getting the scissors and glue out and giving it a whirl? It’s much easier than it looks! If you do make one, or if you’ve made an elk and you don’t see it above, please send (or resend) it to us on twitter (@tearawaygame) so we can add it to our virtual and real life galleries. Next challenge: someone make a giant one please!